Garcetti’s statement came as about a dozen protesters continued to camp outside Getty House, the official mayoral residence in Windsor Square, demanding he take action over Ford’s death. The mayor also said he called Ford’s mother, Tritobia, on Sunday night and hoped to meet with her in the coming days. “I didn’t reach her but left a message, telling her my heart goes out to her and her grieving family, as it has since the news first broke last August,” Garcetti said. Protesters descended upon Garcetti’s house early Sunday morning, holding pictures of Ford above their heads as they outlined their demands. The demonstrators, part of the Black Lives Matter movement, called on Garcetti to fire LAPD Chief Charlie Beck and for the Police Commission to conduct its review of Ford’s shooting in a public forum. 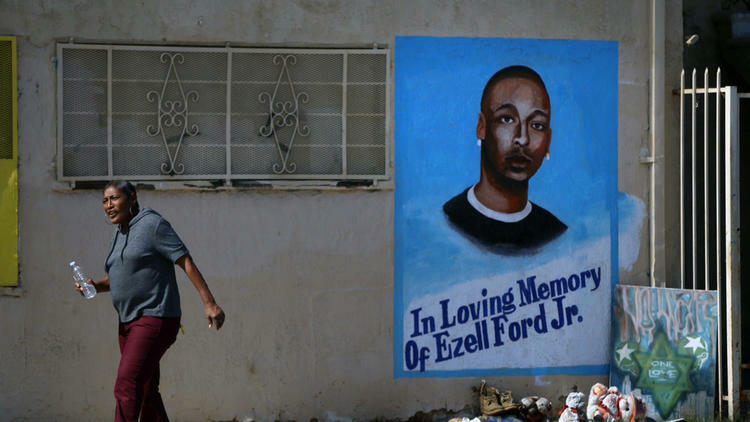 Read More Ezell Ford shooting: Mayor says commission’s review will be ‘impartial’ – LA Times. This entry was posted in News from the Soul Brother and tagged Black Lives Matter, Eric Garcetti, Ezell Ford, LAPD, Los Angeles, police abuse. Bookmark the permalink.